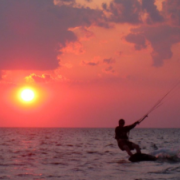 Puget Sound Kiteboarding Association - Pacific Northwest, Seattle, Tacoma, Bellingham and surrounding areas • View topic - Moving to Seattle - any kiting meetups to join? Moving to Seattle - any kiting meetups to join? I am moving to Seattle in a week and started kiting this past summer. Any meetups (on or off the water) that happen all year around that I should watch out for? Would love to get into the community as soon as I get out there. Re: Moving to Seattle - any kiting meetups to join? Any time it's windy there are people on the water. I've yet to meet an unfriendly kiter, so just strike up a conversation. The new board of directors ran on a platform of more kiting events. Keep an eye out for them here. They'll be 'stickies' on the top of the general forum or on the events calendar. Also, use these links to figure out stuff about the different beaches we have around here. Some of our launches are nasty, but fun. Expert only. Some are chill, but fun. Access for all. You will also need to get your meteorologist degree. UW has some good courses. haha, of course I am kidding, until you try and figure out the forecast. Head to Urban Surf too cause those dudes are way chill and will be able to knowledge you up.